I’ve been a guitar nut since I was ten years old. That long-haired guy with the guitar – that was me all through school (I know, the long-haired part is difficult to believe, but it’s true!). After studying music at Solano College with Delbert Bump in the early 80’s, I attended a fancy music school called The Musician’s Institute in Hollywood. Ever since that time, I’ve been fortunate to have the privilege of “Living the Dream” of a pro muso: Playing gigs, recording albums, making videos, teaching…I love it. Teaching music is something I’ve long been passionate about. I have taught thousands of private students here in the San Francisco Bay area (No, I’m not exaggerating) and also have students that all around the world whom I teach via the internet. If you read Guitar Player Magazine, you’ll find that I occasionally publish guitar lesson in those pages too. I believe music is for everyone. I have yet to meet one person who is unable to make music on one level or another. All styles (Jazz, Classical, Blues, Rock, R&B, Funk, Samba… you get the idea) and skill levels are welcome. Whether you’re already a pro player wanting to learn a new style or you’re a ground-zero beginner, I’ll get your fingers moving. You can find me all over this crazy internet. Want proof? 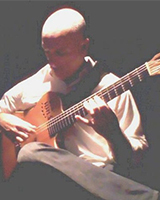 Google “That Jazz guitar guy on the internet" (with quotes). Yep, that’s me. Pretty funny huh?